Pacesetter Systems, Inc, Valencia, CA, a manufacturer of quick-die-change systems and metal-stamping accessories, introduces to show visitors its line of Air Glide heavy-duty pneumatic die lifters. 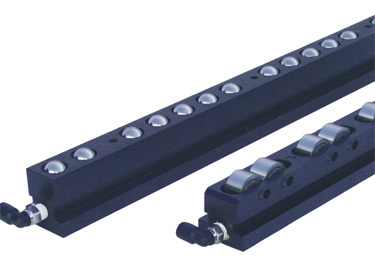 Air Glide lifters are available with ball bearings for multidirectional movement or cylindrical bearings for inline movement. Both models feature extra-large, precision-ground bearings and high-quality o-ring seals. With the die lifters, which use standard shop air pressure and install easily in standard ANSI T-slots, it takes just 40 lb. of force to move a 2000-lb. die. Order from stock in 5/8-, 3/8- and 1-in. sizes, to 72 in. long; custom lengths and metric sizes are available.